It’s itchy, dry, and flaky. Dandruff is more than a nuisance for your kitty, it can be the first symptom of a more serious illness. Here’s what you need to know about dandruff in cats. Your kitty’s skin and coat are among the first body systems to respond to changes in your cat’s health. Dander is produced naturally in the process of shedding dead skin, and it can be seen as small white particles throughout your cat’s fur. Dandruff, however, is larger and often accompanied by scaly looking skin. It’s most often found near the base of the tail and persists even after grooming. Just like in humans, dandruff can form as a result of not getting the proper balance of nutrients and not consuming enough water. Environmental changes, like excessive dry heat, can also be to blame. Other causes of dandruff can be more serious, though. Your cat could be having an allergic reaction to his or her food or household chemicals. Parasites such as fleas, mites, and worms can also irritate your cat’s skin to the point of flaking. Such parasites can lead to even worse health problems if they aren’t removed quickly. Worse still, dandruff one of the more visible symptoms of diabetes. 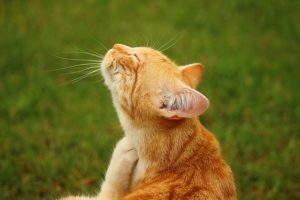 If your cat is also experiencing increased urination, weight loss, lethargy, increased appetite, and frequent urinary tract infections in addition to dandruff, diabetes could be the cause of it all. First, you should start with the changes that are easy to make. Adding more pet fountains to encourage your cat to drink water and switching to a higher quality wet cat food will not only keep your cat hydrated and full of healthful nutrition, but it’ll also improve your cat’s quality of life. Establishing a grooming routine can also sooth the problem if your cat is older or unable to clean his or her fur properly. Don’t forget to take a trip to the vet to find out if the source of the dandruff is something more serious. Is brushing and grooming a part of your cat care routine? Our sitters are happy to brush your cat as often as you do during our visits. Drop us a line to be paired with one of our attentive sitters today. Photo by rihaij on pixabay.